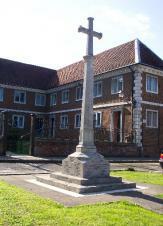 Buntingford's War Memorial is located on Market hill outside the Alms-houses. It is constructed of Portland Stone and is looked after by the Town Council. It lists not only those who died in the two World Wars but also those that gave their lives in later action. A Town Parade is held at 10.45am on Remembrance Sunday with a full service. There is also a gathering at 11am on the 11th November with a very short service.